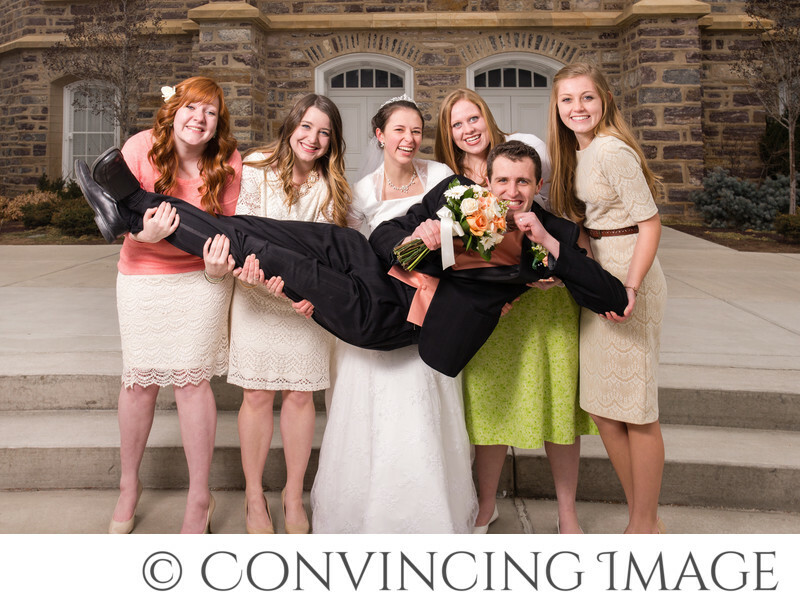 Can you believe that we photographed this beautiful Logan Utah bridal party (with the groom) in January? It definitely didn't look like January with the lack of snow. But It felt like January with the typical extreme cold. I know, it's your wedding day, everything should be perfect. But what if it's not? What if it's a windy day? What if it's -10 degrees outside? What if the sun is so hot you're dripping with sweat? This is our recommendation for all these situations: plan for it! Watch the weather! If the cold is coming for your day, add some extra layers under your dress. Give your groom some hand warmers to stick in his pocket to so you can swipe them occasionally and get warm. If it's supposed to be super hot, bring ice water bottles and keep them close by. You may even consider buying a little hand fan for between shots to keep you from glistening too much. What about rain? In all honesty, umbrellas make a fun prop for photos. Rain, backlit with a flash, is actually really pretty. Don't stress about rain on your wedding day. Now if it's raining sideways with a bunch of mud, you may want to have a backup plan to keep you out of the mud, but plan for it, then you won't be stressed and your day will still go smoothly. Finally, do your best to relax. It's your day and while everything weather-wise may not go as planned, you will remember the day and perhaps laugh about the mishaps. Location: Logan Temple, Logan, Utah.